Background: The multifactorial origin of upper alimentary tract cancers encompasses environmental factors mainly associated with diet. Pteridium aquilinum—bracken fern—is the only higher plant known to cause cancer in animals. Its carcinogenic toxin, ptaquiloside, has been identified in milk of cows and groundwater. Humans can be directly exposed by consumption of the plant, contaminated water or milk, and spore inhalation. Methods: In order to determine the association between bracken and upper alimentary tract cancers a systematic search was conducted using MEDLINE, PubMed, EMBASE, Current Contents Connect, Cochrane library, Google Scholar, Science Direct, and Web of Science. Results: Original data was abstracted from each study, the pooled odd ratio and confidence intervals were not calculated as there was no comparable data. However, each study showed a substantial increased risk associated with bracken fern. Conclusion: The current medical literature suggests a serious risk to human health from bracken, and increasing media coverage of the subject is likely to lead to greater education and prevention strategies. Further epidemiological studies are required. Ries LAG MD, Krapcho M, et al. , . Seer cancer statistics review1975–2004. 2007. Villalobos-Salazar J. Carcinogenicidad del pteridium aquilinum y alta incidencia de cáncer gástrico en costa rica. Rev Cost Cienc Med 1985, 6: 131–139. Hirayama T. Diet and cancer. . Nutrit Cancer. 1979, 1: 67–81. Marlière CAS, R. C.; Galvao, M. A. M.; Soares, J. F.; Evangelista, C. L. M.; Gomes, R. F. Q. . Rev. Bras.Cancerol., 1998, 44(3), 225. 1998:44(43), 225. Thomson JAW, C.; Shearer, C. M. . In bracken: Ecology, land use and control technology. ; 1986. Miranda MM, J.; Moya de Madrigal. L. Acta Méd Costaric 1977, 203, 207. 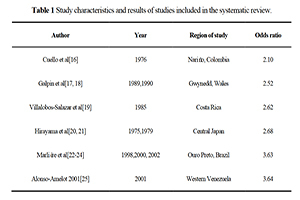 Villalobos-Salazar JM, A.; Rojas, J. L.; Mora, J.;Porras, R. E.; Herrero, M. V. In bracken toxicity and carcinogenicity as related to animal and human health. International Bracken Group Special Publication. Univ. College North Wales, UK. 1989:40-51.